The WeSC Clothing company has been around for some time now, founded in 1999. The company's CEO is Joseph Janus who previously worked for Calvin Klein. as the advertising and marketing, senior vice president. 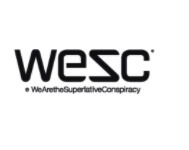 The word WeSC is short for We Are The Superlative Conspiracy. WeSC makes a more refined type of streetwear good for after skate life. The company’s products include graphic t-shirts, sweatshirts, shirts, hoodies and varsity jackets WeSC is heavily influenced by skateboarding and snowboarding and has strong ties within the hip hop communities through sponsoring Swedish underground rap artist and hip hop groups such as Looptroop and Timbuktu, this made the brand very popular with young Swedish people. "WeActivists" is a name given to the skateboarders, musicians and sponsored individuals who work closely with the company. Explore our range of Wesc streetwear clothing on everythinghiphop.com today.